Spaniard Carlos Checa delivered on the pre race hype by setting the fastest time onboard his Althea Ducati at Valencia today. The 33 year old spent the majority of the session lapping on his own, with one notably quicker lap mid way through to top the time sheets. Michel Fabrizio looks to have bounced back from his woeful performance in Portimao to take second ahead of a fast starting James Toseland in third. Toseland completed 22 laps in the session and by the end was lapping in the high 1m 35’s consistently. Troy Corser looked fast and smooth onboard his factory BMW in fourth ahead of Max Biaggi in fifth who jumped up the leader board in the final minutes. 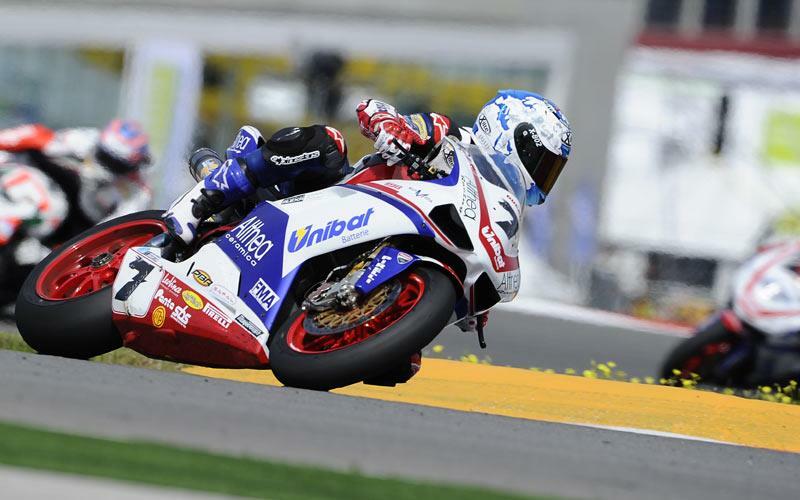 Championship leader Leon Haslam claimed sixth, with Rea seventh and 2009 Valencia winner Noriyuki Haga in eighth. Leon Camier ran in the top five but dropped to ninth at the finish ahead of Tom Sykes tenth, Cal Crutchlow in 12th, Shane Byrne 15th and Simon Andrews 17th. First qualifying gets underway at 3.45pm local time.